This photograph shows Beatrix Potter as a young girl, with the Rev. William Gaskell, Minister of Cross Street Chapel (Unitarian) Manchester. William was the husband of the famous authoress Elizabeth Gaskell and a great friend of Beatrix's father, Rupert. Beatrix Potter was the daughter of Helen and Rupert Potter and was born on 28th July 1866 at their London home. Helen and Rupert Potter were both from prosperous north west Unitarian families who had made their money through the cotton trade. Her paternal grandfather, Edmund Potter was a successful cotton manufacturer with mills at Dinting, near Glossop, a radical MP, and a friend of Cobden and Bright. Her maternal grandmother, Jane Leech was from another prominent local Unitarian family, the Ashtons of Hyde and was the sister of Thomas Ashton the first Mayor of Hyde. She married John Leech, of another local Unitarian family in 1832. They had eight children (two of whom died in infancy) and it was their daughter Helen who was Beatrix Potter's mother. Beatrix's grandfather, John Leech bought the Gorse Hall estate on the Stalybridge - Dukinfield border in 1835. Stone from nearby quarries was later used to build a mansion with stables, laid out gardens a vinery and greenhouses. The Leech's were a very wealthy family and were the main benefactors of Stalybridge Unitarian Church. Stalybridge Unitarian Church began as a Sunday School, something not uncommon in those days, and Jane Leech gave up part of the family home, Hob Hill House (before the building of Gorse Hall), to enable the school to be started. Later, the family gave a plot of land on the edge of the estate and substantial donations for the building of the church. Mrs Jane Leech laid the foundation stone on Whit Sunday 1869 and the church was opened on Thursday February 17th 1870. Mrs Leech presented a bible to the congregation to commemorate the occasion. On the following Sunday the first services in the church were conducted by the Rev. William Gaskell of Cross Street Chapel. John Leech had died at Gorse Hall in 1861 but Jane lived on there until her death in 1884. They are buried in the family vault at Old Chapel Dukinfield. Beatrix's parents Helen and Rupert Potter are buried in the Potter family vault at Hyde Chapel Gee Cross. 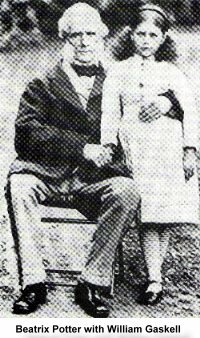 Beatrix recorded in her journal details of visits to Gorse Hall and of holidays taken with their family friend, William Gaskell. The journal also reveals something of her personal faith and view of religion and it is clear that she was greatly influenced by her Unitarian upbringing. In 1912 Beatrix returned to Stalybridge to open the Annual Church Bazaar. Established in 1999, this local group aims to promote the use and knowledge of the Gorse Hall site for residents of Stalybridge and Dukinfield. They have produced nature trails, conducted surveys of bird life, flora and fauna on the site, have been a channel for the views of local people about the future of the site and have mounted displays, not least The Beatrix Potter Connexion, held at the church in July 2000. Bearing in mind our close association with the Leech family, Stalybridge Unitarian Church intends to work closely with The Friends in the future to ensure the ongoing preservation and utilization of the site.